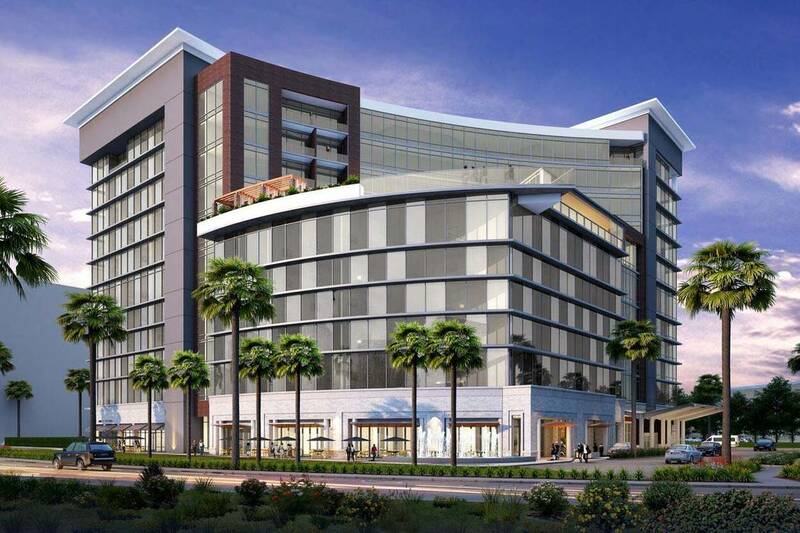 A rendering of the planned Caesars Republic Scottsdale. | Courtesy of Caesars Entertainment Corp.
A brand that's best known for its ornate casino and hotel in Las Vegas is setting up shop in the Phoenix area with a non-casino hotel. Caesars Entertainment Corp., which operates Caesars Palace on the Las Vegas Strip, announced last month that it will break ground on a 266-room, four-star hotel in Scottsdale later this year, the Las Vegas Review-Journal reported. The hotel will be Caesars' first venture in North America that doesn't include a casino, the Review-Journal reported. It will be called the Caesars Republic Scottsdale and will be the first use of the Caesars Republic brand. The Scottsdale hotel will have ballrooms, boardrooms and suites, along with a coffee shop, a restaurant, bars and a rooftop pool with views of Camelback Mountain, the company said. The site for the hotel is just north of Scottsdale Fashion Square, near the intersection of Goldwater Boulevard and Highland Avenue. It's slated to open in 2021.